ABSFIXER.COM / ABS EBCM Repair / The Pro's Choice! We now repair the Corvette ABS modules experiencing the C1214 diagnostic code..
Click HERE to get your modules repaired NOW...!!! A complete repair service to your existing Corvette (2001-2004), Pontiac, Cadillac, Impala, Ford F-150, GMC, or Chevy Silverado, Avalanche, Yukon, Venture, Suburban, Sierra, Z71, Tahoe, Blazer, Jimmy, S-10, S-15, Isuzu Rodeo and Amigo, Honda Passport or Opel Frontera. WE ALSO SELL REFURBISHED MODULES TOO!!! Now offering an upgrade service to your operational EBCM! 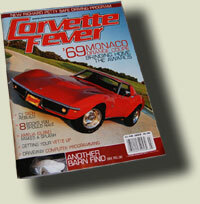 Not only has ABSFixer been recommended by General Motors and many websites and tech forums in the past, but recently we have been featured in the tech section of March '08 Corvette Fever Magaizine. We really do appreciate it!!! Let us repair your bad ABS module! Typically, these rascals will go bad and need to be replaced, that's right replaced. Dealers and repair shops deal with these problems by what we call the shotgun approach (fixing something by replacing many things or one big thing). That's fine, except for when the part exceeds $400 and on top of that, $200 for labor. Most of us can't deal with the expense so we'll just pull the fuse and go on with life blinded by our ABS warning light and sometimes the "Traction off" indicator glowing in our face. Brandon, I just reinstalled the module that you repaired. It works perfect. I sent a link to your website to all my "motorhead" friends. Thanks for saving me $700 plus....You guys are awesome!!!!! Brandon, It was delivered Tuesday and Joe got it in last night. It was a wonderful site to see that ABS light go off! Thank you so much for offering such a great service. You can be assured that we will spread the word around in PA.